We had over 800 Rotarians, family members and friends at the Winston-Salem Dash game last August. It was a great evening that started with the Rotary logo on the scoreboard, and ended with children running the bases after the game. 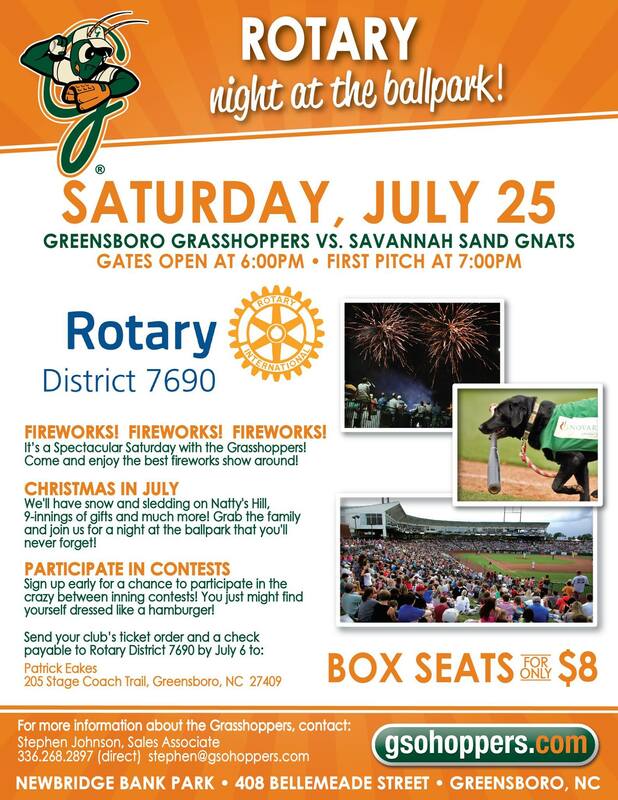 On July 25th , we will hold our 2nd Annual Family of Rotary Baseball Game with the Greensboro Grasshoppers. This year will be even better, since it is the Christmas in July game. The night will feature Santa and sledding on a snow-covered hill just beyond left field. 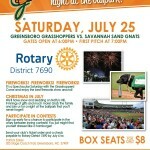 And don’t forget the Rotary Children’s Playpark inside the stadium, and a great fireworks show right after the game. This is going to be a fun budget-friendly family evening that only costs $8 per person. Mitzi Ellis, our 2015-16 Crescent Rotary Co-Director of Fun will order all of our tickets together using one order form. Please email Mitzi BEFORE July 6th to order your tickets.